Thrusday night was the Stampers By Design Summer Bash and what a great time we had! There were about 25 of us from my upline/sideline group there. We started out by catching up and meeting new friends and doing our make and take project that Cindy Lawrence (the same Cindy that is a member of the Splitcoast Dirty Dozen--can you believe she's my third level upline--talk about some GREAT inspiration!) had planned for us. Isn't it just divine? This card uses ALL new products!! The stamp set is Upsy Daisy and the colors we used were two of the new In Colors Baja Breeze and Kiwi Kiss (however we did use an Old Olive marker to color in the stems). The Designer Series Paper is Urban Garden. The image is stamped on a die-cut piece of cardstock that was cut using the Top Note Bigz Die (a Stampin' Up! exclusive) and the Big Shot. This was such a quick card to make...which is a good thing when you have like 12 people crammed inside a screenhouse all making the same project! Then we went inside and crammed our plates full of delicious food. We each brought an item to eat or serve dinner with. I brought a Summer Squash Casserole (link to recipe). Cindy and her family provided us with Hot Dogs, Hamburgers and all the fixings. They were such awesome hosts! These baskets were made by the lovely and talented, Ann Walker. They are made using the Baskets & Blooms Bigz XL Die (a Stampin' Up! exclusive) and the Big Shot. Quick and easy to make! These were filled with plain and cherry cordial Hershey Kisses. Chocolate!! My favorite!! These would make great favors for any type of party and can be made with cardstock or designer paper. After dinner, Lynn Larson did a demo on the Big Shot. Even though I have been using mine, her demo was very informative and she had some great tips on how to use it. She even showed us a few projects she had designed using the Big Shot. Next we played "STAMPO" -- the stampers' version of BINGO. We each got a card with the letters STAMP across the top and stamps in the rows. Cindy would pull out an alphabet stamp and a design stamp and call "A - Leaf", "S - House", etc. I actually was the second winner of STAMPO and I won a set of Hidden Garden Rub-Ons. I love those flowers along the top with the frames around them. If you like them too, book a party with me and we can do a make and take with them! We had a lot of good laughs and I look forward to the next time we all get together again...hopefully I can make it to Fall Fest, however my fall weekends seem to be filling up fast! Well, I must go get ready for a demo I'm doing on the Big Shot at the Ink Away group meeting later this morning. Have a great long weekend and check back for more photos! A couple weeks ago was another birthday at work and I made this card for the occasion. I really like the Crab & Company set, but I hadn't had a chance to use it since I bought it, so I thought this would be the perfect time. I started with a Whisper White card base and then I punched a 1 1/4" circle from a Post-It Note. I placed the circle on the card base and sponged over the top two-thirds of the card with Tempting Turquoise and Brilliant Blue. Then I took off the Post-It Note and sponged (with a different sponge) the Summer Sun into the white area. Next I tore a strip of Tempting Turquoise cardstock to look like waves and adhered it with SNAIL. Then I tore a strip of Sahara Sand cardstock for the beach and adhered it with SNAIL. I stamped the crab and the birthday cake slice onto a piece of scrap Whisper White cardstock. I colored them in with the markers and then cut them out and mounted to the card with Dimensionals. Finally, I stamped the "snappy birthday" in Basic Black on the "sand". Tonight is the Stampers By Design Summer Bash and hopefully I will remember to bring my camera and take some pictures to post for you. I can't believe how much stuff I have to get done in the next couple days! Time seems to be in short supply this week. I'm SO glad that I have a three day weekend because there is just too much stuff to cram into two days! Saturday will be the Ink Away meeting, so there might be more photos from then too. Check back to see! Hope you enjoyed today's card sample and have a great day! Aren't these cards just adorable?! I got the idea from duchiedog on Splitcoast. These were made for my Open Studio/Retiring Stamp Set Class and the fair. The pink one's background is embossed using the Swiss Dots Cuttlebug Folder in my Big Shot. The elephant stamp is from the set Year After Year and it was stamped directly onto the DSP and then cut out with the Paper Snips. I used my NEW Scallop Edge Punch to make the "curtains" out of strips of DSP and I used dimensionals to pop up the elephant and the "curtains". These were fairly quick and simple to create and they really look nice. If anyone is in need of baby cards I have several of each left over that I would be willing to sell or swap. I hope you enjoyed today's card samples and helped inspire you! Have a great day! This is another card that I designed for my Open Studio/Retiring Stamp Set Class and that sold out at the fair. I also put a few in the Church's Apple Theme Basket that they were raffling off and guess who won it? ME! I NEVER win anything at raffles, so it was pretty unexpected that I won that and the Fishing Theme Tackle Box that my DH really wanted. So, I'm giving the cards to a friend that really liked the cards and had tried to win the basket. This is the Give Thanks Stamp Set. The card base is Confetti Cream CS and the layers are Glorious Green and Real Red. The ribbon is 5/8" Real Red Grosgrain. It's hard to tell in this photo, but the two apples on the left of the pail are attached with dimensionals. I watercolored the apples, pail and leaves using Aqua Painters. The watercoloring took the longest, but it was definitely worth it since it looks so much nicer than when I tried just coloring with markers. This was another card I had at my Open Studio/Retiring Stamp Set Class and to sell at the fair. The Pale Plum layer was dry embossed using the D'Vine Swirl Embossing folder from Cuttlebug with my Big Shot. I think it really enhances the elegance of this card. I used the Blossoms Abound Stamp Set which is a two-step set. I first stamped the more solid blossom in Pale Plum and then I used the second blossom in Perfectly Plum on top. The leaves were done the same way using Certainly Celery and Mellow Moss and then I cut them out and attached them with Dimensionals. A very simple, but beautiful card! I still have several of these available if anyone is interested in purchasing some. I have some that say Congratulations, Happy Anniversary, and some without any wording depending on what you may be looking for. Thanks for stopping by, I hope you enjoyed today's sample and have a great day! Wow, where has the time gone?? Summer is almost over and I feel like it just started! I am so sorry for the long absence. Last week I worked about 12 hours a day plus my 2 hour a day commute and tried to get ready for my Church Fair that was last Saturday. CRAZY! I was so wiped out! I even worked Sunday to try to get the workload caught up. Now this week is almost gone too! The fair went well and I sold about 60 cards. I had wanted more variety and several of each design, but because last week was so crazy I didn't get anywhere near what I had planned to do done. I'm just hoping to get more word of mouth business by being there and maybe get people interested in attending classes and purchasing cards and products. The open studio went well. The attendance was lower than I had hoped, but I had a great time with those that came and I'm just glad to be able to really use the studio now. Here is a card we made at the Open Studio/Retiring Stamp Set Class. I will be showing more in future posts, but don't forget these Stamp Sets are now retired. I got the idea for this card from kath13 on Splitcoast. Her card had more layers and different colors, but I was trying to keep the cards fairly simple so that stamping newbies could make them without too much difficulty. The DSP is from the discontinued Prints Pack and the Stamp Set is Unfrogettable (retired). The hodgepodge hardware accent on the bow is also discontinued, but they have cool new colors for this new catalog! I can't wait to get my hands on the Very Vanilla!! I also sold this card at the fair and I sold out of them! I guess I'll have to make some more for next time! Thanks for stopping by...I'm off to work now. I did another card using the card sketch I posted the other day. This time I kept it much more simple, but I think it still looks very elegant. It only took me a few minutes to make one and as a bonus I am using up some of the left over In Colors and Designer Series Paper that is retiring soon! I hope you had a great weekend and check back soon for more card ideas! I was so psyched this morning to receive an email from my second level upline Dorene Decibus, an awesome and inspiring stamper, that my card below was selected to be posted on Stamper's Showcase. What is Stamper's Showcase? 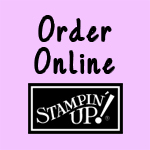 For those of you who don't know, it is a part of the Stampin' Up! Demonstrator site where a few cards are featured every day. It is a great place to check out new ideas and to see how other people use certain stamp sets. This is my first card to be posted, so I'm very happy. I really liked this one! I made this card as a swap that Dorene put on for the Stampers By Design Demonstrator group several months ago. I hope you enjoy the card, and don't forget...this stamp set goes away June 30th! Well, I have to get ready for my class tonight and go to work. Have a great day and happy stamping!